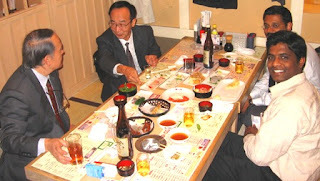 Sivakumar's Journey: Japan Tour - Party Time! Japan Tour - Party Time! It’s been long time since I wrote in here; I think I’m in my final days in Japan. Just wanted to cover some skiing experience before leaving from here, most probably it will happen next week. My boss had hosted a farewell party for me; the picture shown above is from that party. There is a video uploaded to youtube, will do some more interesting videos very soon. Actually if you look at the hotel, we were sitting on the ground a typical Japanese style hotel. For people with baloon type belly :-) it's a task to be noted.